Right around the equinox, springtime came to Alaska in a big way —glaringly clear skies, sunlight, and temperatures in the high 30s and low 40s. Although Beat returned to California on Monday, I'm lingering for a few more days thanks to plans to race the White Mountains 100 in Fairbanks. Beat had to quickly go back to work and routines — always a difficult transition amid the mental and physical recovery of a month-long journey. I feel guilty about remaining in Alaska to play, but I also have been struggling with feeling overwhelmed myself — managing logistics and deadlines amid a tight timeline, thinking about the many projects I need to finish, the summer plans I need to begin preparing for, and also just wanting to be home with Beat. I feel like I should smack myself in the head because it's early spring in Alaska, the weather is beautiful, trail conditions are superb, and I need to DO ALL THE THINGS before it's too late. Perhaps I'm a little travel weary. Just about the only hours I don't feel anxious or overwhelmed are when I'm outside riding my bike. I also got in one great run this week, my best since before the ITI. I ran six and a half reasonably fast miles on the packed snow of the Chester Creek Trail on Tuesday evening, after it finally became "cool" enough to run. (The mid-day "heat" here, although barely scraping the 40s if that, still feels abnormally warm under direct sunlight. I have no idea how I'm going to cope with 80-plus degrees once I return to California.) I was stoked about this run because I felt strong for the first time in weeks, with none of the shin pain or dead leg fatigue that I experienced in Juneau. So I had a good run, but mainly I have been putting in some medium-length rides on my bike to assess both bike and body conditions ahead of the White Mountains 100. The front brake of the Moots fat bike somehow imploded. After two weeks of adjusting the lever and riding it when I possibly should not have been, I realized the caliper was leaking fluid and had to have it replaced with a mechanical disc brake (Argh. But I can't ride the hilly White Mountains 100 with my skills and only one brake.) As for my body, I have some concerns about my left knee, which begins to develop sharp patellar pain (my usual knee-bike issue) after three hours. I'm going to try testing different saddle heights, but it already feels the best when the saddle is on the cusp of being too high. All pre-race reports point to fast and largely rideable trail conditions, so I might have to adapt for long hours in the saddle without much pushing. To be honest, 100 miles of biking kind of scares me right now. I suppose this is a good thing. 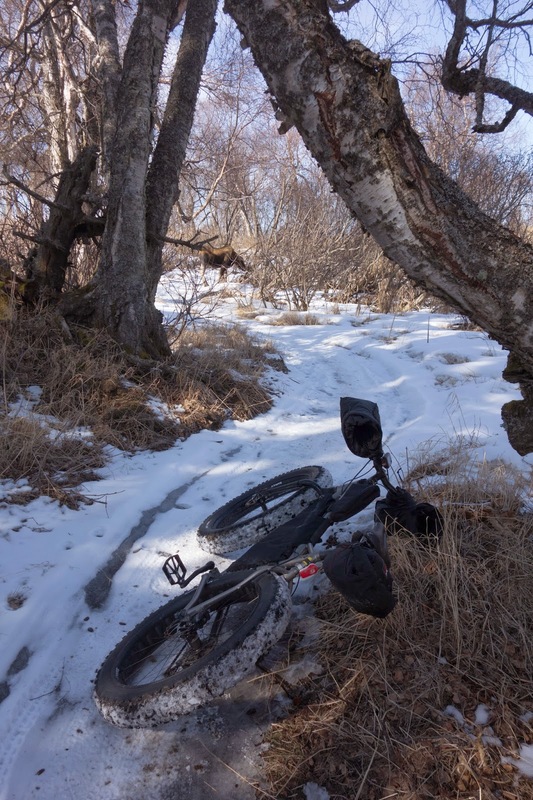 On Monday I managed a 36-mile ride in Anchorage that was almost entirely on snow. I love that I can leave my friends' house in the middle of town, and in two minutes reach a groomed pedestrian path that leads to a huge network of well-packed singletrack throughout the Chugach foothills. Anchorage is awesome in that regard — you can ride dozens of miles in city limits entirely away from vehicular traffic and often on trails. One thing I don't deal with very well are singletrack mazes. I get disoriented easily and it doesn't take long before I have no idea where I am or which direction I'm going. After riding a fun trail called Moose Meadow, I could not relocate the Rover's Run connection. I inexplicably kept returning to the same intersection until I thought I might be losing my mind. This intersection was in view of a paved road, so I opted to veer over to the road and coast a mile down to a known trailhead. The sun was setting, and all of the day's snowmelt had solidified into black ice. I still didn't have a front brake at this point. Coasting down the road at 20-plus miles per hour, I lightly tapped the back brake, which sent the rear wheel into a sharp skid that jack-knifed the bike sideways. I really thought I was going down; I even envisioned the impact in slow motion, the way you sometimes do in that heart-sinking second before an inevitable big crash. But as I let off the brake, the bike somehow righted itself, and I was able to coast to the bottom of the hill with terrifying momentum because I knew I couldn't hit the brake. 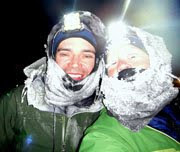 Once I reached the trailhead and returned to the safety of snow, I could not stop shaking. I put on all of the clothing layers I was carrying, but it didn't help. I was a shivering wreck for all of the six miles home. Wednesday's ride went much more smoothly. I sprinted out the Coastal Trail to Kincaid Park to check out the trails there. The hillsides of Kincaid were nearly snow-free, and in some ways reminded me of trails I ride in California during the wintertime — golden hillsides, narrow singletrack cut into steep side slopes, and big, gnarled trees that resemble the oaks back home. Could I actually be feeling homesick for California while riding in Alaska? Hard to accept, bit I think that was the case. The Kincaid Trails were not California friendly, though. They were pretty much a sheet of ice covered in a thin layer of loosely packed powder — about as slippery as surfaces get. Without studded tires I was not able to ride much. I was about to give up anyway when I encountered a moose blocking the trail, so I turned around and sprinted home. Not counting time wasted on trail ambling, that ride netted 29 miles in just over two hours. Super fast snow conditions. On Thursday I headed north, opting to rent a car and drive up to Fairbanks. I love this drive, probably because I've only done it in good weather, but Thursday was an absolutely spectacular day for a cruise on the Parks Highway. The big mountain was out in a big way, and I'd stop at all of the still-closed roadside viewpoints and stomp through the snow to get another glimpse outside the car. 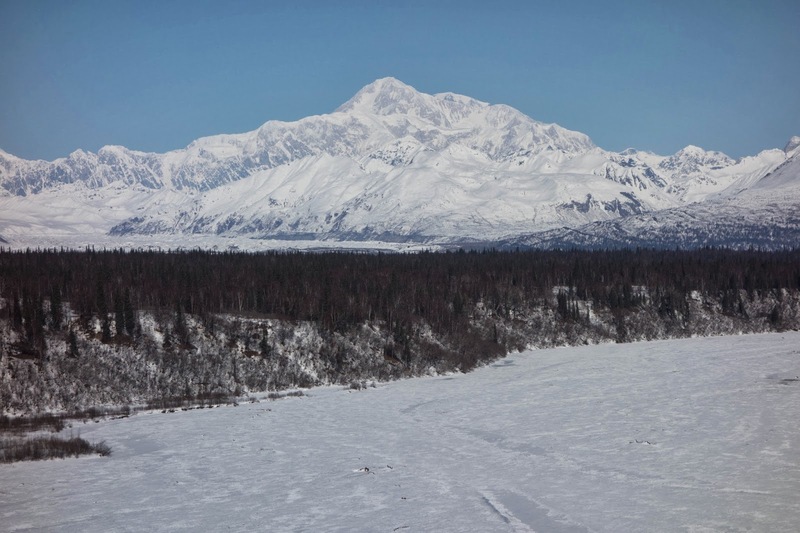 Denali is such an impressive mountain. Standing at a point near sea level and staring up at something 20,000 feet higher gives me chills, every time. I hadn't necessarily planned to ride on Thursday. 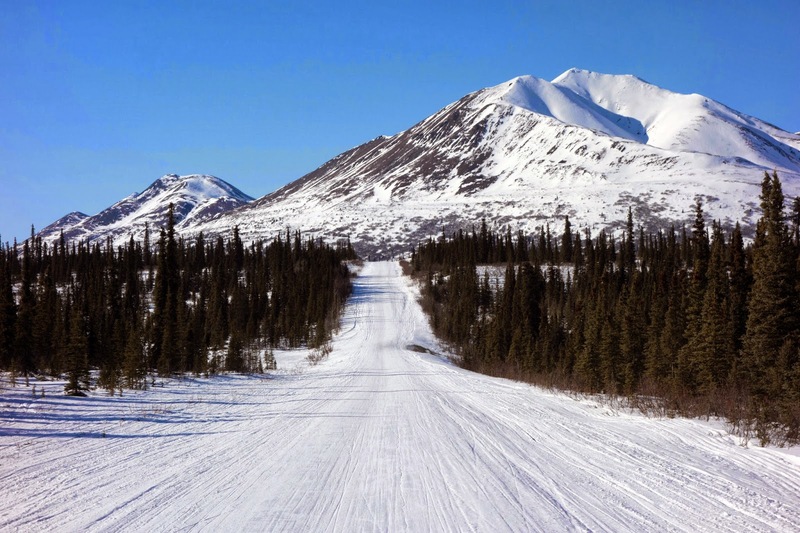 But as I approached the small town of Cantwell, I wondered about the conditions of the Denali Highway. 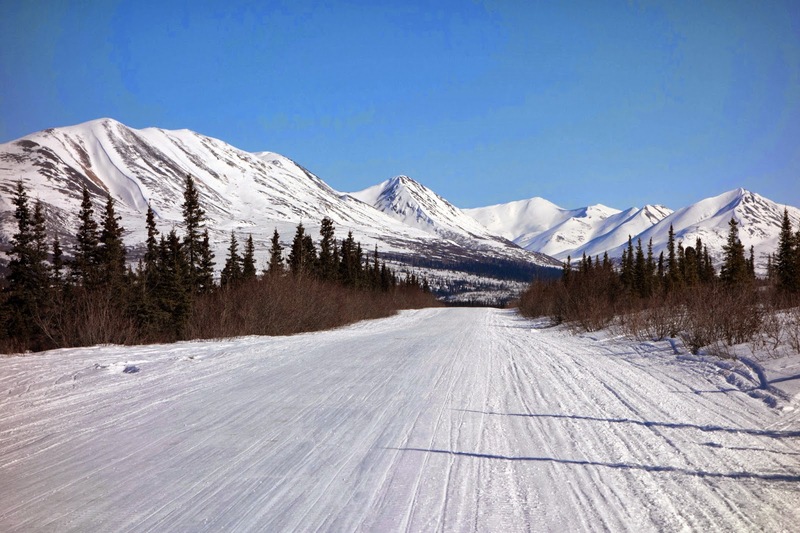 This 135-mile gravel road is unmaintained in the winter, but is well-traveled by snowmachines thanks to a couple of lodges along the way. Three friends and I bike-toured part of this route from the Paxson side last year, when trail conditions were so soft that we had to work hard to maintain a 4-mph average. Thanks to the low snow year, current conditions are smooth and hard-packed. 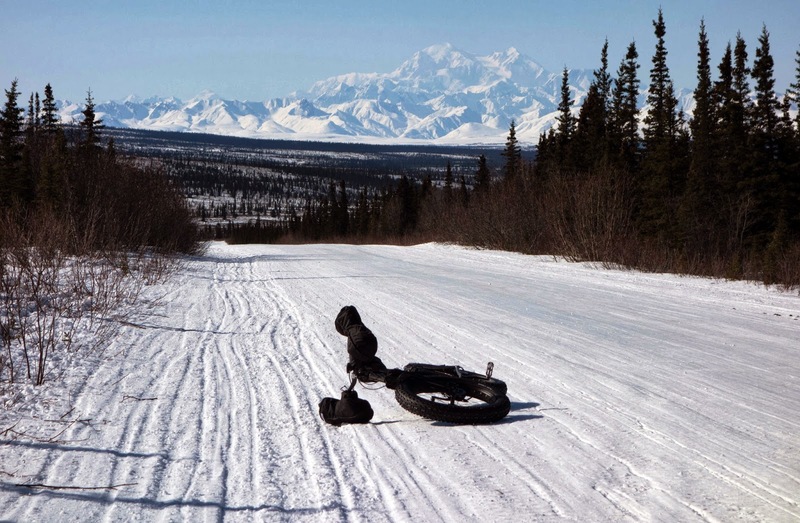 Having ridden the much of this chunky gravel road in the summer, I'd say the Denali Highway is in better shape for biking right now than it is in June. There was some glare ice that I had to walk around, and further out the road the surface started to become progressively softer. A stiff headwind fought forward motion on the inbound ride, and made the 25-degree afternoon feel quite brisk. But wow — fast and fun conditions right now. 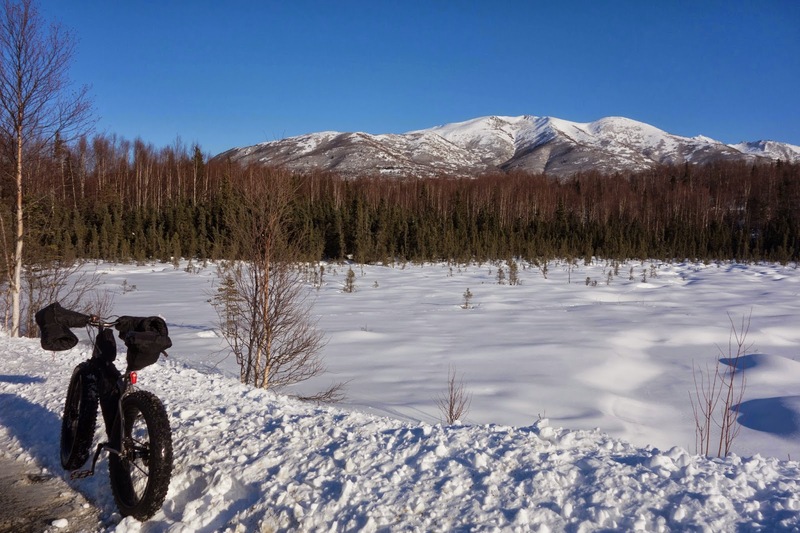 I had some dinner plans in Fairbanks, but the fun riding and amazing scenery kept pulling me eastward. I finally tore myself away after 17 miles, when a long climb was really starting to become tedious and guilt about being late for dinner and "saving the legs" for the White Mountains 100 started to kick in. 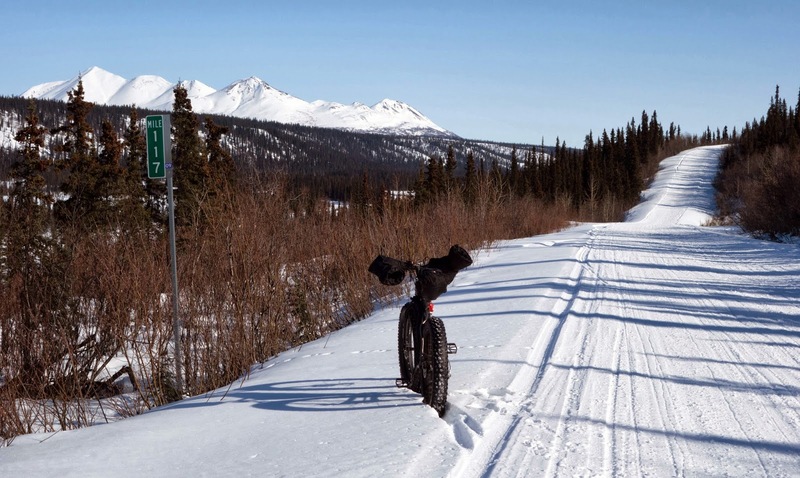 Still, 34 miles in three hours, not too shabby for the Denali Highway during the winter. Today, my friends Joel and Erica guided me on an 11-mile loop on equally fast and fun trails in Fairbanks. So I actually managed a solid week of fat bike training, 110 miles. Yes, it was the week before the race, when I should have been tapering, but I figured it was the only training I was going to get. Anyway, it was important to get re-acquainted with the fat bike, and work out a few kinks. The White Mountains 100 begins Sunday morning. I'll try to post an update on Saturday with some links. All in all I feel pretty good about the race. I'm worried about my knee, and feel some pre-emptive regret about squandering a potential "fast" year when I feel a lot less than fast. But I have confidence in my endurance, and a plan to waste as little time as possible (there probably will still be plenty of photos and inevitable checkpoint slumming.) I'll do the best I can, and love it because it's the Whites. Oh, I so understand that transition back to work, it is so so hard. Poor Beat. I also only feel right in the woods lately.